1. Research your market. Determine the audience that will be most likely to read your book. Knowing your target demographic will make your marketing efforts much easier—and more profitable! 2. Research distribution methods. Find out the best ways to reach your potential readers. Will your target demographic be more likely to purchase your book on an e-reader or in print? Do you want your book to be available online through Amazon and Barnes & Noble, or in smaller bookstores? If smaller stores are your preference, meet with the owners to learn what requirements must be met in order for you to sell your book on their shelves. 3. Research standard e-book and print book formats. For the electronic version, you’ll need to consider EPUB and MOBI formats; for print, trim size will be very important. When deciding on a trim size, compare similar books in your genre to get a good idea of the standard size. 4. Format and proofread your manuscript. Before you make your book available to the masses, make sure it is in tip-top shape! Have your manuscript professionally formatted and proofread so your finished product is error-free! 5. Purchase an ISBN. ISBNs are must-haves if you intend to sell your book in stores or online. Make sure you have a different ISBN for each version of your book as well (e.g., Kindle, Nook, Print). Get the 411 on ISBNs here. 6. Design a book cover. They say you shouldn’t judge a book by its cover—but buyers do it every day. Make sure you have an attractive book cover that is eye-catching, thought-provoking, and representative of your book. Sometimes the quality of a book’s cover can make or break a sale. 7. Create an author website. This is critical if you plan on selling your book yourself, since an author website is the best way to promote your book and your author brand. Your author website will act as a hub for everything about you and your book: it will give potential fans an opportunity to learn more about you, while offering current readers an up-to-date resource for more details about your next project. 8. Set up a mailing list. Once you have an author website up and running, your next step should be to create a mailing list. It’s great to have fans visiting your author website, but it would be even better if you had your visitors’ email addresses so you could send updates on your books and events directly to their inboxes. That’s where a mailing list comes in very handy! 9. Create social media profiles. An online author platform relies on traffic and engagement to increase book sales. With social media profiles, you can steer potential fans to your author website and engage in real-time conversations with fellow readers and writers. But it’s imperative that you actively and consistently update your social media—so be sure you’re ready for the commitment. If you don’t have the time to regularly maintain your social media profiles, Writer’s Relief can help! 10. Schedule public appearances. While an online marketing strategy is vital to online sales, word of mouth can be just as effective. Engage your own community by giving readings at local libraries and bookstores. If you’re intrepid enough, you could try booking an interview with a local radio station to help spread the word about your book! BONUS—Find someone to help! Self-publishing can seem like an overwhelming task, especially to an author with limited or no publishing industry experience. So don’t go it alone! Self-Publishing Relief can help guide you through each step of the process. To find out how Self-Publishing Relief can help you publish your book, click here. 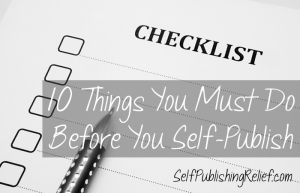 QUESTION: What else have you done to prepare for self-publishing your book? 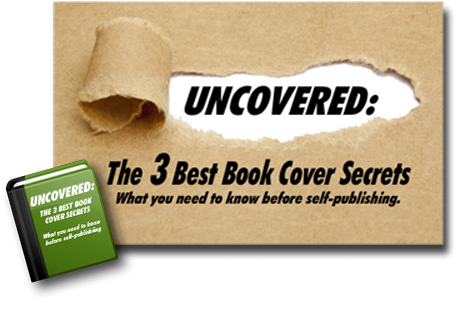 ← Vanity Presses and Self-Publishing: What’s the Difference?